Ravina Shamsadani, Spokesperson for the Office of the UN High Commissioner for Human Rights. Dozens of children have been killed since fighting began in the north-western Syrian town of Afrin, where people are under bombardment, hospitals have been shut down and water supplies cut off, the United Nations has reported. Along with Eastern Ghouta, the Kurdish-held town is now among the worsening flashpoints, as the conflict in Syria enters its eighth year. “We have been receiving deeply alarming reports from Afrin in Syria about civilian deaths and injuries due to airstrikes and ground-based strikes,” Ravina Shamdasani, spokesperson for the Office of the UN High Commissioner for Human Rights (OHCHR), told reporters in Geneva on Friday. She said that the humanitarian situation is reportedly worsening, with Afrin Hospital, the only medical facility equipped for major operations, being inundated by the influx of injured people. “There is also a severe water shortage due to the reported destruction of a pumping station as well as the control of other water resources by Turkish-led forces,” Ms. Shamdasani said. She also said that reports indicate that only those civilians who have contacts within the Kurdish authority or the Kurdish armed forces have been able to leave the town. Civilians are at risk of being killed, injured, besieged, used as human shields or displaced as a result of the fighting, she warned, reminding all parties to the conflict that they must permit civilians wishing to leave combat areas to do so in safety, and to ensure the protection of those who remain. “Families are relying on untreated water and boreholes, potentially increasing the risk of waterborne diseases for about 250,000 people,” said UNICEF Communications Specialist Joe English. He said that there is no official displacement tracking mechanism but local sources estimate around 50,000 displaced people in the city. Families are being hosted by relatives and friends, in shops, government buildings and schools. He said he “profoundly” regrets that the countrywide ceasefire demanded by the Security Council has not been implemented. “The reality on the ground across Syria demands swift action to protect civilians, alleviate suffering, prevent further instability, address the root causes of the conflict and forge, at long last, a durable political solution,” he said. 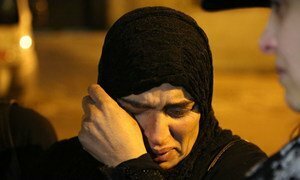 Two United Nations relief agencies on Wednesday joined a chorus of international organizations and partners in the quest to end seven years of conflict in Syria, urging warring parties to allow humanitarian access for the delivery of life-saving assistance to those desperately in need.